Kyle was last seen leaving Buckhead Saloon in uptown Charlotte, NC around 2:20 a.m. on Nov. 9 and has not been seen or heard from since. The sudden disappearance of Kyle Fleischmann on Nov. 9, 2007 led his family and friends to turn their tragedy into an educational opportunity so that others would know where to go for help and information in the critical first days of a person’s disappearance. What a HANDSOME young man. How baffaling! I applaud his family for taking this unbearable time to educate others in their position & share their experience. It made me think of the ANT's. IMO, this is the type thing they wanted to do, but, they are not credible so they are just seeking publicity. I hope there is some resolution to this story, good or bad, the parent's need to know what happened to their son, jmo. Linda Marie, for posting this thread about this wonderful young man. He had such potential and would have been a productive and caring member of Charlotte's community. He has been greatly missed. ALL COUNTIES — It has been over two years since 24-year-old Kyle Fleischmann disappeared in downtown Charlotte. Today, according to his friends at the Kyle Fleischmann Foundation, the case has been transferred from the missing person's unit to homicide. An update on Kyle's case will air Saturday, December 12 on America's Most Wanted. "Our hope is that this national coverage, combined with the busy time of year, can help lead to public chatter that will help us resolve Kyle's case," said Daniel Scagnelli, who founded the Kyle Fleischmann Foundation after his best friend disappeared. 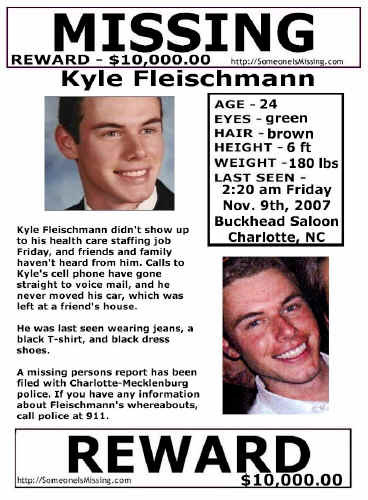 Kyle was last seen in the early morning hours of Friday, November 9, 2007, in Charlotte. He met Scagnelli and some friends for drinks at the Buckhead Saloon. Scagnelli and his wife eventually left, but Kyle stayed at the bar. Kyle was last seen on surveillance video leaving the Buckhead Saloon around 2:20am. He left a black pea coat and his credit card behind. According to Scagnelli, Kyle made two calls about an hour after he left the bar. One call was to Daniel, the other to his roommate. Kyle didn’t leave a message. He has not been seen or heard from since. In the days following his disappearance, Kyle’s friends and family found they had little to go on. They searched the area where they believe he made his last call, based off the phone signal, but nothing was found. The people Kyle hung out with that evening said there were rumors of a party in the hotel next to the bar. After hearing about Kyle’s disappearance, people who were at the Buckhead Saloon that evening came forward but no one remembered seeing him there. Investigators have hit a dead end. His friends and family have worked tirelessly conducting searches, holding vigils and organizing fundraising events, hoping to keep Kyle’s case in the public eye. His story has gained national attention, being feature on America’s Most Wanted, along with several news stations and newspapers in the Charlotte and Raleigh-Durham area. His friends also started a “Help Find Kyle” page on Facebook in addition to the website, www.helpfindkyle.com. Today, there are almost 70,000 members. “We really want to keep his name and his story alive,” said Suzanne Roberts, Fleischmann’s friend. “The more thoughts and prayers the better,” Scagnelli said. “It’s been hard." The night he disappeared, Kyle was wearing a black shirt, jeans and black dress shoes. He is 24 years old. He has green eyes, brown hair and is six feet tall, weighing 180 pounds. Kyle Fleischmann is an all-American guy. The handsome, 6'0" tall Elon University graduate is well-liked, and his friends and family say he's very outgoing and fun to be around. 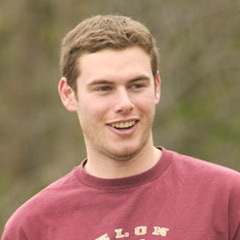 While he attended Elon, Kyle was Vice President of his fraternity, where he was actively involved community service initiatives. His friends say Kyle liked to have a good time and had his head on straight. So the nature of his sudden disappearance after a night out with friends and family has Kyle's loved ones fearing the worst. On Thursday, November 8, 2007, Kyle caught Dane Cook's stand-up act at Bobcats Stadium in Charlotte, N.C.
Kyle's mother and sister were also in the audience, and when the show ended Kyle and his friends walked to Buckhead Saloon, where he met his family. Kyle's friends and family left the bar while Kyle stayed back, until the Saloon's security camera captured images of the 24-year-old exciting the bar around 2:20 a.m.
Kyle made several phone calls between then and 3:30 a.m. but didn't leave any messages, and hasn't been heard from since. Kyle returned to neither his car nor his home, and all calls that have since been made to his cell have gone straight to his voicemail. Police say the activity on his cell phone after leaving the Saloon is concentrated in the uptown Charlotte area and the First Ward area. His cell phone activity ended around 4:00 a.m.
On November 13, 2007 they conducted a massive search effort, starting at the Buckhead Saloon where he was last seen. They say they'll continue to look for Kyle until he is found. The employee told police Kyle came in by himself, but the restaurant became very crowded shortly after. This timeline shows Kyle captured on surveillance video in various locations after his friends left. Fleischmann also made several phone calls into the night, including calling his father's office 4 times in 8 minutes. Cops say a witness came forward in October 2008 who saw Kyle after he left the Buckhead Saloon. The witness, an employee at Fuel Pizza in Charlotte, N.C., says Kyle came into the restaurant a few minutes after leaving the bar. Cops say it would have been around 2:25 a.m. The employee told police Kyle came in by himself, but the restaurant got very crowded shortly thereafter. Cops say the employee never saw Kyle leave. But the new lead has not brought investigators any closer to finding Kyle. They are still seeking any information about the night he went missing. Friends and family members of Kyle Fleischmann, who disappeared nearly four years ago in Charlotte's uptown, hope national TV exposure Monday night will help stir activity in the case, according to a report from the Gaston Gazette. Fleischmann's story was featured on Lifetime network's "Vanished," hosted by Beth Holloway, the mother of Natalee Holloway, who disappeared several years ago in Aruba. Fleischmann was 24 when he left the Buckhead Saloon in the uptown area on a November 2007 night, and he was seen on surveillance video a short time later near Fuel Pizza. That was the last confirmed sighting of Fleischmann, although there were numerous reports that he was seen within the next hour or two at the north end of the uptown area. Numerous searches in the intervening years have yielded nothing. His father, Richard Fleischmann, told the The Gaston Gazette that the pain hasn't ended. "For my wife and I, there isn't an hour a day we don't think about him." The family said it has hired a private detective, and Charlotte-Mecklenburg police say they have maintained an investigation into the case. But there are no new leads. Richard Fleischmann told the Gazette that the family believes someone knows something that can help break the case. "We believe it was two to three guys, or whatever the case may be, and one of them actually took his life," Fleischmann said. I feel so bad for these parents, four long years and they still don't know what happened to their son. I just wish they'd find out, one way or another so these people could have a bit of peace.